Clip-On Air Chuck with 1/4" FPT Haltec H-4660A / Bowes HT 27-688. 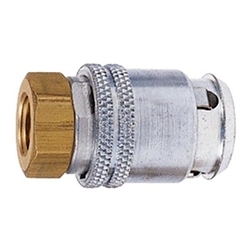 Securely locks onto valve when sleeve is pushed forward, releases when sleeve is pulled back. Has 1/4" NPT female thread.